If you have vegetarians or vegans at your Thanksgiving table, you may think the abundant number of side dishes are enough to satisfy. But often these traditional holiday recipes include ingredients like chicken broth, butter, and cream. Thankfully, there are plenty of potato and sweet potato recipes, fall-themed vegetable side dishes, and green bean casseroles that are appropriate for a vegetarian or vegan diet, and delicious enough for everyone to enjoy. Many people feel that Thanksgiving isn't Thanksgiving without mashed potatoes on the table. But since almost all recipes contain butter and milk, and many include cream or sour cream, a bowl of luscious mashed potatoes may seem unattainable for vegans. A recipe for vegan mashed potatoes with fresh herbs, however, achieves the same texture as the traditional using soy milk and vegan margarine. The onion, garlic, and herbs bring added depth and the nutritional yeast offers hints of cheesy flavor. If you make a vegan gravy to serve alongside, everyone can enjoy this quintessential pairing. 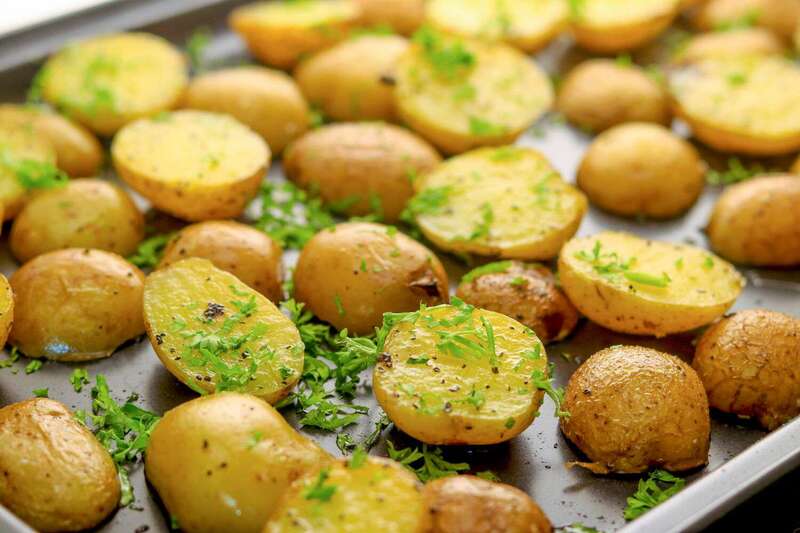 Variations on potato dishes are endless, from the simple—like ​easy oven-roasted baby potatoes, roasted thyme and sage potatoes, and roasted rosemary potatoes—to the more complex, such as vegan potatoes au gratin, vegan scalloped potatoes, and spicy vegan scalloped potatoes with green chilies. Sweet potatoes or yams are a longstanding Thanksgiving tradition, in just about any form. You can make whipped sweet potatoes, baked sweet potatoes, oven-roasted, or use them in a casserole. Vegan coconut sweet potatoes uses coconut milk to create creaminess as does vegan sweet potato casserole with pecans. Maple glazed carrots and sweet potatoes is a great dish for anyone as it doesn't include any butter or dairy. The vegetables are roasted in olive oil and then drizzled with a maple syrup-Dijon mustard mixture. And for something different (and to free up some oven space) try some grilled sweet potato fries coated with a lime-oregano oil. Green bean casserole is, for some reason or another, a traditional Thanksgiving side dish all over the United States. But it is usually made with cream of mushroom soup and milk, which means vegans have to steer clear. This vegan version, however, creates the same creamy texture and umami flavor with a margarine roux, soy sauce, and garlic and onion powders. Adding the crispy fried onions on top will remind you of the one Mom used to make. If you're not a fan of green bean casserole but want to include green beans on your Thanksgiving table, there are several interesting ways to prepare green beans, including vegan Asian green beans, roasted green beans, and buttermilk fried green beans (not vegan). Once a vegetable that was frowned upon, Brussels sprouts have certainly found their place in the culinary world, taking a prominent place on restaurant menus and holiday buffets. If you are planning a vegetarian and/or vegan meal, just be sure you don't choose recipes that include bacon or cheese. Take simple roasted Brussels sprouts to the next level by drizzling with a mixture of balsamic vinegar and oil before cooking. Or try a recipe for browned Brussels sprouts, where the vegetable is caramelized in a hot pan in a garlic butter and then tossed with lemon juice, garlic, salt, and paprika. If you would like to serve a dish that has the flavor of bacon, Brussels sprouts with white wine and shallots features vegetarian bacon, which is cooked and then combined with the sprouts, white wine, and shallots in the oven. For a simple and familiar Thanksgiving side dish, carrots are a popular choice. Whether roasted or glazed with sugar or maple syrup, carrots will add some color and nutrition to your plate. If you are cooking vegan, butter may be the "forbidden" ingredient you encounter most often with carrot recipes, but if you replace with vegan margarine, as in easy caramelized carrots and glazed carrots with cinnamon, everyone can enjoy. The recipe for vegan maple-glazed baby carrots uses vegetable oil instead of butter and cooks the carrots along with maple syrup until nicely coated, finishing with a dash of salt, pepper, nutmeg, and cinnamon. Cranberries, in one form or another, are practically a requirement at any Thanksgiving table, and, cooking them from fresh or frozen doesn't need to take too much time or energy. Most of the time, cranberry sauce is appropriate for a vegan diet—even the kind from a can—but a more interesting version would add a special touch to the Thanksgiving table. It is the apple in spiced cranberry sauce with apple and orange that is unexpected and creates an added texture and fall flavor to this quintessential Thanksgiving condiment. Almost like a mulled wine version of cranberry sauce, vegan cranberry sauce with Cabernet combines the red wine with orange juice and zest, cinnamon, sugar, and a pinch of cayenne to add a little kick. And cranberry sauce with blueberries brings the fresh taste of both berries together along with a bit of vanilla for added sweetness. There are a wide variety of regional traditions when it comes to Thanksgiving side dishes across these United States, but sometimes we need a little inspiration—especially if this is your first time making a vegetarian or vegan Thanksgiving (or at least a few dishes). Considering corn was at the first Thanksgiving, it only seems fitting to serve today, and a vegan creamed corn is a wonderful way to do that. Of course, winter squash is always welcome at the feast, so why not make a quick and easy butternut squash, sweet crockpot butternut squash, or butternut squash and apple casserole. If you are looking for something green, but also comforting, a quick vegan creamed spinach should do the trick. And a cranberry, wild rice, and barley pilaf salad is a nice addition, especially for the vegans and vegetarians who aren't eating turkey.